This is Prophets Russ and Kitty Walden! 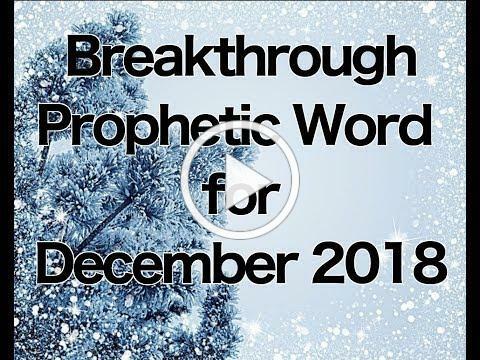 Below you will find the video for the December 2018 Breakthrough Prophetic Word over your life! (Transcription Included!). The Father says today this is where it gets easy. This is where it gets easy says, God, for I am all about yoke easy and burden light. Those who have cried “the burden of the Lord, the burden of the Lord” are excluded for My heart is to lighten your load and bring you to the effortless grace of radical change and reinvention by My hand. Accept no substitutes says, God, for there are many who would strap you down and load you up with convoluted and complex solutions of man that produce nothing of consequence your life in terms of answered prayer or needed deliverance. Look up says, God. Set your face forward toward My glory for I have invested in you – all the works and benefits and dividends of the Calvary. Say in your heart “it is the Father that does the work…” for I am working. I am going before you to make the crooked paths straight. I am coming up behind you with signs, wonders, and miracles. Get ready for the unusual says, God. Get prepared for the unique and the unexpected. I don’t work along the lines of man’s understanding because where I am taking you – man’s rationale, logic, and intellect will never go. Be willing to be clueless. Be willing to accept as Abraham understood that I called him and I am calling you to go out “whither you know not where…” Realize and embrace that once and for all that I am your way and I am your truth, and I am your life. In so doing you will then you will cease from your own labors and your own plans and just roll over on your back in the river of life and let My current take you wherever I will. This is the yoke easy, and this is the burden light, and this is the dynamic I am installing on the inside of you that will release to you the grace that transforms and the grace that changes those things that you cannot change, and you cannot alter. I am sending ministering angels to you in your wilderness experience. As they gave angels food to the prophet of old and went in the strength of that food for 40 days – so the next 40 days will be days of supernatural strength and sustenance. Even your natural appetites will be affected says, God. You are going to push back from the table because there is a fullness in you that doesn’t originate in what came off of the stove or from the grocery store. Something supernatural and unusual is taking place. You will go to bed hungry and wake up full for the angels have visited you in the night feeding you on My grace and refreshing you with the waters of My favor. Receive it says God for this is your portion. Receive it for therein lie the answers to questions you have asked and asked and asked for so long. Things are shifting, and things are changing. Oppression is lifting and refreshing by My hand is coming. The heaviness of heart is going, and lightness of spirit is visiting upon you with joy, joy unspeakable and full of the glory that originates from My throne. It’s a new day says, God, and in a new way you will know Me, and in a new way you will see the salvation that I am working in every area of your need sparing none for I have set My love upon you and My favor has found you to radically transform your life in every area says the Father. Now, what is your point of contact with this word? Every word from heaven comes to pass and manifests in your life as you engage with it by acts of faith and anticipation. I want you to go to propheticnow.com and sow into this word. Every word mixed with faith immediately begins to come to the place of manifesting the substance. Do it without hesitation. Reject the voice of doubt and embrace the overture of heaven to open this aperture of grace over your life by a willing release of your appreciation for what God is about to do. Why is giving so important to what happens next in your life? Because – when something leaves your hand to God, something leaves His hand to you. Your offering is your point of contact with the promise of God to see it come to pass. There is marrow in this word and there is substance in this word to TURN YOUR LIFE AROUND and move things in the direction of God’s fullness and God’s promise, so act now and know that it is the most powerful thing you can do at this moment to step out of what is and in your new bright future in God’s destiny for your life. I sowed please agree for breakthrough! Thank you for this Word and I already sowed.